Depression is the most common psychological symptom in patients with systemic lupus erythematosus (SLE). A large fraction of these patients remains undiagnosed due to subclinical presentation or is missed in the routine workup of SLE. Many factors have been reported in the literature which can be used as predictor of depression in SLE. Lupus patients also have higher risk of suicidal tendencies than the general population. 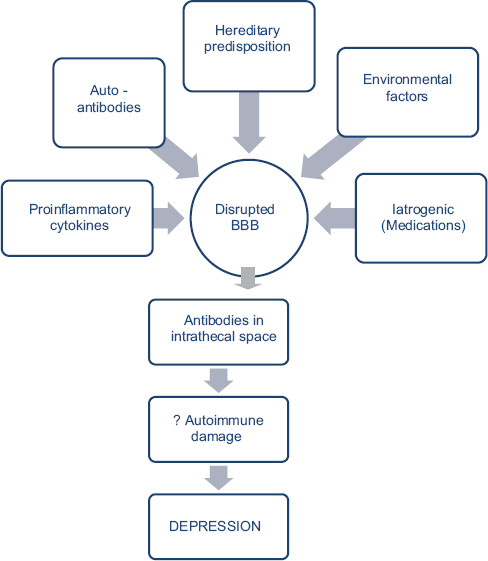 Pathogenesis of depression in SLE is multifactorial and involves complex interactions between cytokines, antibodies, genetic factors, etc. Approach to such patients consists of studies that establish diagnosis of SLE, distinguish between organic and functional etiologies, and exclude symptoms not due to SLE. Various hematological, cerebrospinal fluid investigations, electroencephalography, psychometric testing, as well as neuroimaging modalities are involved in diagnostic workup of lupus patients with depression. Patients with only psychological causes for depression are treated with antidepressants. While in case of organic disease, one treats with glucocorticoids, immunosuppressants, and antidepressants. Electroconvulsive therapy can be considered in very severe cases not responding to maximum therapy. Introduction: The world health report in 2002 demonstrated a rise in prevalence in noncommunicable diseases in developing countries such as India. The prevalence of becoming overweight among children has markedly increased over the past 20 years. Body mass index is the most widely used parameter to define obesity. This study was conducted with the aim to find the association in children of higher socioeconomic status who are battling overweight or obesity as a problem and studying in private schools in West Delhi. Materials and Methods: This was an observational cross-sectional study conducted in two private schools in Delhi, India, during school hours from July 2013 to June 2014. 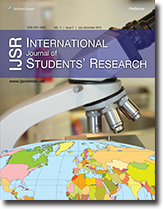 Students of age group 10–18 years studying in Class VI to XIIth were included in this study. Children with a history of chronic illness were excluded from the study. Results: This study enrolled a total of 1250 students. This was a cross-sectional study conducted in two private schools in Delhi, India. Seven hundred and fifteen (57.2%) were males and 535 (42.8%) were females. A maximum number of students (254, 20.3%) were in the category of 11-year age group. In all categories of age groups, male children were more than female children except in 17–18-year age group. Prevalence of overweight children was 11.8% and obese children was 7.5%. Overweight children were maximum in 11-year age group (20.1%) and minimum in 17-year age group (5.3%). While prevalence of obesity was maximum in 18-year age group (15%) and minimum in 15 years of age group (3.2%). Incidence of overweight was more in males (56.5%) than females (43.5%). Obesity was also more in male children than female children. Conclusion: This study demonstrated a higher prevalence among overweight (11.8%) children compared to children who are obese (7.5%). Junk food consumption, dietary habits, sedentary lifestyle of using technology as entertainment, and easy modes of transport to school are perhaps the contributors to give rise to the higher prevalence of health issues in these children. The results of this study can be applicable to similar future studies. Health education regarding prevention of obesity and its risk factors leading to mortality should be included in the curriculum in all schools. Regular health awareness program for parents and children should be conducted from time to time to assess healthier lifestyle motivation among city living population. Omphalocele, a type of anterior abdominal wall defect, is a rare congenital deformity that is infrequently reported, which leads to the emergence of interventions that could be carried out for a better holistic management, for the baby, mother, and the family. 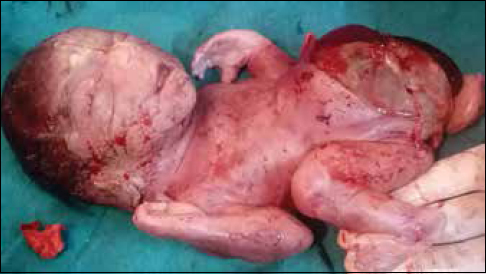 We report a case of single dead fetus of 24 weeks gestational age delivered by a 25-year-old primigravida. On examination, it was observed and diagnosed that the baby presented with extrusion of multiple abdominal organs through a midline breach in the continuity of anterior abdominal wall suggesting it to be a case of omphalocele. It had other associated congenital deformities. Of all the investigations, ultrasonographic assessment of fetal structure and well-being is most reliable along with other investigations like genetic screening. The lack in the proper antenatal examination and infrequent routine checkups leads to a large proportion of undiagnosed cases. Proper diagnostic measures and awareness will bring a marked reduction in perinatal morbidity and mortality and avoidance of stigma faced by the patients. Balint's syndrome is a rare visuospatial disorder usually associated with bilateral and rarely unilateral parieto-occipital or just parietal lobe lesion and sometimes temporal lobe. It is characterized by triad of spatial disorder of attention/simultanagnosia, psychic paralysis of gaze/oculomotor apraxia, and optic ataxia. The most common etiologies for developing this syndrome are stroke, Alzheimer's disease, and brain trauma. 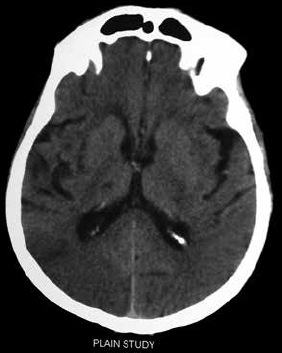 A 70-year-old hypertensive male patient complained of difficulty in executing his day-to-day work. He gave history of sudden onset left-sided weakness of his body 8 months back which resolved in a period of 1 month. He complained some visual disturbances later on which he ignored. On examination, he had all the three features of Balint's syndrome as noted above. His plain computed tomography brain and skull revealed infarct in the right parieto-occipital region, lacunar infarcts in capsule-ganglionic region and multiple site of senile cortical atrophy. Radiological findings along with clinical findings and history mentioned above, the patient was diagnosed to have Balint's syndrome as a complication of brain injury in parieto-occipital area by stroke.